Wake up time of 0400! Some may think that this isn’t necessarily a problem, others may think that at this time one should still be sleeping, and some may fall in-between these 2 views. Whatever my or your view on this matter, that was the time I had to wake up and, somewhat to my surprise, I didn’t feel too bad; perhaps this was due to my brain not yet realising what was happening! I’d generally prepared everything the night before, so after a decent breakfast I loaded the car and set off. Part of the reason for getting up so early was so that I could register that morning from 0730 rather than going up the day before and then leave the necessary items in the transition area before 0900. Having a poor performance the week before in a 10k run due to painful and cramping muscles that started a week earlier, I was hoping that my legs would have recovered enough, but I was still slightly nervous about this issue. 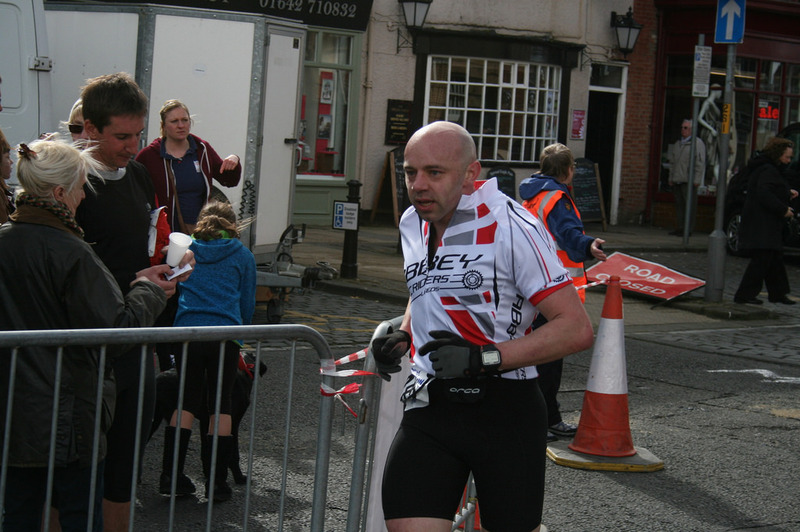 Stokesley is a small market town near Middlesbrough that had set up the transition area and start/finish area by the town hall. There was music playing and plenty of onlookers about for a Sunday morning. All those taking part appeared to be busying themselves with preparation, including the all-important bathroom stop. Whilst standing in the starting area, I was shivering whenever the wind stepped up, but figured I’d eventually warm up. 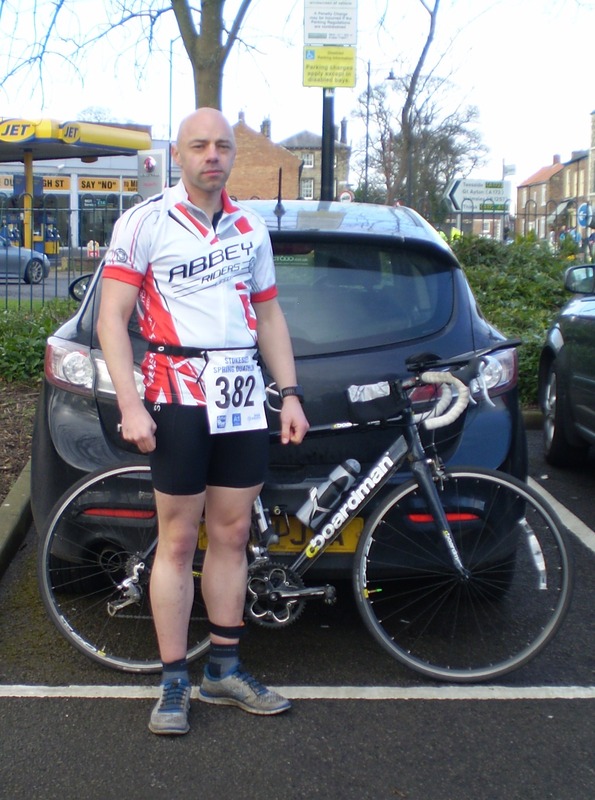 This event was the first official outing of the new Abbey Runners cycling top [a.k.a. Abbey Riders], which can be seen in the photo above. It is quite snazzy, and I hoped it made me look as if I knew what I was doing. The first run was a simple out-and-back 5km course. The route went briefly along the small riverbank before heading out to the industrial estate where the turn-around point was stationed. I set off amongst the crowd and seemed to be going quite well. At one point I glanced down at my watch and noticed the time, and thought I better slow it down just a bit. Maybe I should have just run rather than have some concern about my pace so early on, and I am trying, but I also didn’t want to blow it following my previous muscle difficulties. Whilst out on this run, I encountered some people wearing Valley Striders tops, and we exchanged a few words; I’d seen at least 6 of them at the start. The run was generally uneventful and quiet. There were a few people out walking and a few cars passing by, but since it was near the industrial estate, there wasn’t much going on and not much scenery unless you count the many varied garb of other runners. Coming back into the transition area, the noise was louder and it was time to focus intently in order to transition as effectively as possible. This aspect is something that I’ve not really practised, but in my mind, I knew what I had to do, that is, quickly switch from running gear to cycling gear and crack on! My time in transition 1 was quicker than the previous 2 duathlons that I have completed. My run time was only slightly slower than my quickest time in a parkrun in the last quarter of 2013, so that made me quite pleased, especially since I had to cycle and then run again, and because I still felt strong. The cycle route was 30km on open roads. 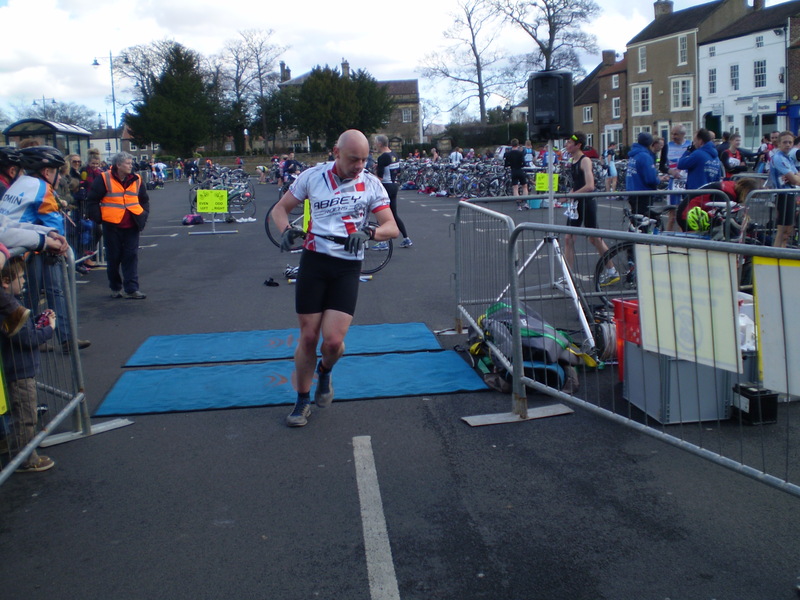 Although I’ve cycled a lot on open roads, both the duathlons I’d entered previously were not on open roads; Stockton had closed roads, and Oulton Park was round a race track. This meant I would need a broader focus. The cycle route left the town along the High Street and headed out to Hutton Rudby, with a nice drop and then a short, sharp climb to get into the village green in Hutton Ridby. The route had several fast descents and sharp climbs. During the safety briefing, we were told to be careful on the descent into the village because at the bottom of the hill on the corner where we turned was a church and it was a Sunday morning. Apparently, some cyclists in the past have collided with church-goers despite there being plenty of signs up stating that a cycling event was taking place! At the end of the village, the route headed out towards Potto and onto more hills; the scenery was quite good though! We continued until we joined the A172, which did not have a slip road, but did have fast moving traffic. 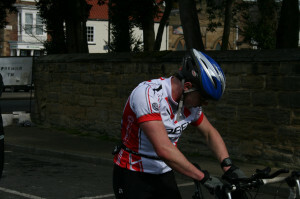 After 3 miles, there was a left incline junction leading back into Stokesley. On the first lap, we had to turn at this point before starting the 2nd lap. On the 2nd lap, I began thinking that I know exactly what is coming up – those hills. Instead of turning off as we did on the 1st lap, we were to continue straight on along the A172 for a further mile or so before turning into Stokesley at the roundabout and into T2. I’d bought some aerobars for my bike to also help make me look like I knew what I was doing, and also because it does help with aerodynamics. I did enjoy using them on the descents and the long stretch of A172, although I was a bit wary using them on some of the descents. During the cycle ride, there was a chronic headwind, which made the cycling that bit harder. If there was any tailwind, I didn’t notice. Despite this, I think I had a pretty good cycle except for one point after a descent, there was an incline, and I shifted the wrong gear lever a few times in quick succession before realising my mistake! I managed to pass quite a number of other people, especially on the uphill sections and on some of the flatter bits. Going along the main road did make passing other cyclist more challenging. The rules of drafting and overtaking say you can enter the drafting zone of 7m and then have 15 seconds to make a pass, otherwise you have to drop back. If you are caught drafting, there are severe penalties, which include time penalties and disqualification. Trying to pass people whilst avoiding traffic coming from behind you was definitely a challenge. During the whole cycle route, I didn’t actually take a drink; I was worried about falling off or crashing. However, I didn’t particularly feel I needed to consume water. Some people had been more creative, and strapped a water bottle to their aerobars and had a straw angled up so they could sip water. This seemed a good idea, but I wonder if some of the water bottles I saw on the route belonged to these people having fallen off. Thankfully, as I was coming back into Stokesley, I managed to time my pace to miss the red light at the pelican crossing; another cyclist wasn’t able to do so and had to stop. The photo below shows me coming into T2 having just dismounted. I was not looking at the camera, but was more focused on my time and efficiency, at least that’s what I think/hope I was doing. The 2nd run was the same as the first, that is an out-and-back 5km run. Prior to leaving T2, I did have a very quick drink of my water. I’ve not done any proper brick sessions for a while to help me transition from running to cycling and from cycling to running, but my training in the gym does include a lot of leg work that serves the same purpose, just more intensely and effectively. As a result, having racked my bike, taken off my helmet, and changed my footwear, I was able to run out of transition without any major difficulty. The photo above shows me charging out of T2. Again, I’m not looking at any cameras, but quickly checked the time because there was some running to be done. Shortly after this picture was taken, I realised I’d not turned the race number round to the front as you should, so I slowed whilst I began fiddling with this for a few seconds before speeding up once more. Unfortunately, at just after the turn-around point, my muscles began to hurt. I was annoyed by this, but glad that they had not gone off earlier in the event. My muscles are still recovering, but weren’t quite there yet. Still, I managed to keep going and was only 3 minutes slower on the 2nd run than I was on the 1st run over the same course. I suppose this means I can’t overly berate myself for this little difference. Coming up to the finish line, I was focused on just one thing – getting across the line. The photo below shows me running towards the finish. I was subsequently told by a marshal that the photographer had tried to get me to smile and/or give a thumbs-up as I got to the finish line. I didn’t even notice the photographer as I was approaching; like I said, I had only one thing on my mind, so I hope he wasn’t too annoyed or disappointed. Or perhaps I need to work on celebrating finishing and a suitable pose! Overall, I was pleased at the finish. This was my best performance out of the 3 duathlons that I have completed, and I did actually enjoy the event. 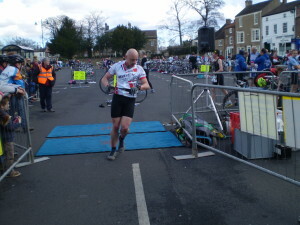 Whilst in the transition area after finishing, I spoke with a few other people about the event. I do find it good that these events have a friendly atmosphere between entrants, not unlike the obstacle/mud runs that I have completed. The buzz you get from this and from crossing the finishing line are great, and it it amplified because of others there who are generally feeling the same way. The next duathlon I’ve entered is at the end of April, 3 weeks after the marathon, so I hope to enjoy that one as well. Just in case anyone is interested, I can be seen coming into the finish at 9 minutes 35 seconds of this video. I’m not running as smoothly as I could [or at least think I can], but like I said, by this point my muscles were causing me some discomfort.